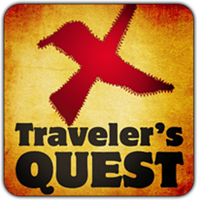 Did you know that Traveler’s Quest is now FREE? Yep, that’s right! In our last release, we added in the Mega Treasure Room In-App Purchase which allows us to give new players a 25 treasure “trial” of our great game for free! Players who love the game can upgrade their treasure room, giving them the same features as our previously paid app. We hope you love the game, and come back to hunt with us again soon! Don’t have Traveler’s Quest? Get our award nominated GPS Treasure Hunt Free from iTunes today!